It is essential for us to review the historical events which led to the splitting of God’s Kingdom Israel and the subsequent idolatry and exile of the Northern Kingdom. This event has left an indelible scar and imprint upon the the sons of Ya’akov. Since that day, there has been a hole in the heart of Israel, a void that cannot be filled except by Hashem, who so desires for both houses of Ya’akov, the House of Israel and the House of Judah, to become one once again. The events of this national catastrophe can be called nothing less than a horrific tragedy of monumental proportions. After the death of King Saul and Jonathan, the men of Judah came and anointed David as King over the House of Judah. This, however, began a civil war. Avner, the general of King Sauls’s army had already anointed Saul’s son Ish-bosheth as King over all Israel at Mahanaim. Previous to the uniting of the tribes under a monarchy, the tribes of Israel were a loose confederation under the direction of the Judges. During King Saul’s reign, Gibeah was the capitol of the nation. Once King Saul was killed and David anointed as King over Judah, the cities of Hevron and Mahanaim were temporarily capitols for the House of Judah and the House of Israel respectively. Avner sought to establish Ish-bosheth as the new monarch over Israel, which is a very logical thing for General Avner to do, demonstrating loyalty to the House of Saul, an admirable trait for the top military job in Israel. However, David had been anointed as King over Israel by Samuel the Prophet years ago when David was a young boy a fact that Avner appears to have known. 2 Samuel 5:1-5 Then all the tribes of Israel came to David at Hebron and said, “Behold, we are your bone and your flesh. “Previously, when Saul was king over us, you were the one who led Israel out and in And the LORD said to you, ‘You will shepherd My people Israel, and you will be a ruler over Israel. '” So all the elders of Israel came to the king at Hebron, and King David made a covenant with them before the LORD at Hebron; then they anointed David king over Israel. David was thirty years old when he became king, and he reigned forty years. At Hebron he reigned over Judah seven years and six months, and in Jerusalem he reigned thirty-three years over all Israel and Judah. Under King Solomon the Kingdom of Israel saw prosperity and peace like never before. Solomon ruled over all the kingdoms between the Euphrates River and to the land of the Philistines. These kingdom’s brought tribute and served Solomon all the days of his life41 and Solomon ruled over everything west of the River. There was peace throughout the land and in the Middle East as well.42 It was during his rule that many great public works projects, including the Temple and the King’s Palace, were built. The Tanakh says that Solomon took in 666 talents of per year. A talent of gold is about 75 pounds. With gold at $1200 an ounce (in today’s terms) that’s about 959 million dollars a year into Solomon’s personal fortune. Solomon had very extravagant tastes. He had golden shields made, each on using 600 shekels of gold. His had a great throne built of ivory and fine gold with six steps leading to it. The steps had two lions on each side, not including the two lions at each side of his throne. All of his drinking cups and other vessels were gold, and nothing was silver. His shipyard at Ezion-Geber dispatched ships to the far reaches of the world and returned every three years with gold, silver, ivory, apes and peacocks. Solomon’s fame was known through out the world and the nations came seeking his wisdom with gift’s of silver, gold, fine clothing, weaponry, spices, horses and even mules.44 For his household Solomon’s daily provision was 30 kors of fine flour, 60 kors of meal, ten fat oxen, 20 pasture fed oxen, 100 sheep, deer, gazelles, roebucks and fatted fowl. His 700 wives, 300 concubine and various children required a lot of food and clothing for their upkeep. This extravagant lifestyle actually becomes Solomon’s undoing. He eventually departs from the faith due to the influence of his wives and his virtual unfettered contact with the pagan princes and kings, from which numerous alliances and treaty’s are made.45 The giving of daughters and maidens was a very good way of sealing the deal and Solomon must have made many deals by the size of his harem. No doubt Solomon had access to the pagan kings’ collection of priests, philosophers, and Magi. It was at this point that King Solomon ventured into forbidden territory and participated in avodah zara or forbidden worship. Three times during his reign, HaShem gave him warning not to abandon the covenant46 but eventually Solomon succumbed to the wealth, the women, and the ways of the nations. Solomon’s fall from grace started many years before his actual fall, but it was his building of a pagan worship center on the Mount of Olives, for Chemosh, a Moabite idol that is the straw that broke the camels back. By decree of the Holy One of Israel, the kingdom of God would be torn from Solomon’s control. However due to the faithfulness of his father David, it would not happen in the Solomon’s life time, but during Rehoboam’s reign. HaShem then begins to raise up adversaries to bring about His decree to Solomon. Hadad the Edomite an enemy of his father, returns from exile. Rezon the son of Eliada, who abhorred Israel and who was a bandit, became the ruler of Aram. And Jeroboam son of Nebat, an Ephramite. The public works projects that Solomon embarked on became a financial burden to people of Israel, not to mention the forced labor to support these building projects. Jeroboam was a valiant warrior and very industrious. Solomon took a liking to him and put him in charge over the forced labor of the House of Joseph (the tribes of Ephraim and Manasseh). It was to Jeroboam that the prophet Ahiyah prophesied he would be the king of the 10 tribes. After ripping his cloak into ten pieces, Ahiyah says: “…take for yourself ten pieces; for thus says the Lord, the God of Israel, ‘Behold, I will tear the kingdom out of the hand of Solomon and give you ten tribes…” (1 Kings 11:31) Solomon eventually learns of this and tries to put Jeroboam to death. However, Jeroboam flees to Egypt and seeks protection from Shishak, King of Egypt. Jeroboam will stay in Egypt until Solomon’s death. • The Beit HaMikdash (the Temple). This project took 7 years to complete. The foundation alone took 4 years (1 Kings 6:37-38). The required manpower was 30,000 forced laborers from Israel, 70,000 transporters, 80,000 stone hewers, and 3300 chief deputies or project managers. 1 Kings 9:20-21 also tells that the non-Israelites left in the land were also used as forced labor. The building materials, such as the Lebanon ceders were brought in from Tyre. There were also builders from both Solomon (Israel) and King Hiriam of Lebanon. • The House of the Forest of Lebanon. This appears to be used for matters of State. 1 Kings 7:7 suggests it was used as a hall of judgement. This official residence and his family estate may have have been adjacent to one another which make the most sense practically and verse 7:8 seems to imply this as well. 1 Kings 10:17 tells us that Solomon put 300 shields of beaten gold in the house. • The Palace of Pharaoh’s Daughter. 1 Kings 7:8. Solomon had married Pharaoh’s daughter for political reasons as stated in 1 Kings 3:1. • The Millo and the breach of the City of David. Both appear to be part of the City of David. It appears from the text in 1 Kings 11:27-28, that the House of Joseph was used as forced labor in these projects. Also see 1 Kings 9:22. • The Wall of Jerusalem, Hazor, Megiddo, and Gezer 1 Kings 3:1 and 9:15. • Gezer, and the lower Beth-Horon, Baalath and Tamar. 1 Kings 9:17-18. • The Shipyard at Ezion Geber. 1 Kings 9:26. This is located on the shore of the Red Sea. • The High Place for Chemosh. 1 Kings 11:7. This was dedicated for the worship of the Moabite god Chemosh. As this list demonstrates a very ambitious plan to modernize Israel, it’s costs must have been staggering. The Temple and Solomon home alone took 20 years to build. This building program must have required numerous taxes from the people to complete. We find in 1 Kings 9:10-14 Solomon’s pay off to King Hiriam for all the work and expense that he incurred during the Temple project and for the men on loan to Solomon. Solomon gave Hiriam 120 gold talents and 20 cities in the Galilee. The giving away of tribal territory would not bode well with the northern 10 tribes. And so the political and economic situation of the days of King Solomon sets the stage for a national calamity that devastates the Kingdom of God and rips the fabric of the social order of Israel of which we have never recovered. Open Rebellion against the House of David. After the death of King Solomon, his son Rehoboam takes the throne. In Egypt Jeroboam hears that his old enemy has passed away and he returns from his exile. Now Jeroboam returns with a hidden agenda. He knows that Ahiyah, the prophet has already foretold of his ascension to the throne over the northern 10 tribes. Thus an arranged meeting between Jeroboam and Rehoboam takes place in which Jeroboam’s party stand against the policies of his father Solomon: “Your father made our yoke hard; now therefore lighten the hard service of your father and his heavy yoke which he has put on us, and we will serve you.”48 They have determined to push Rehoboam on these particular grievances. The new King must have felt as if he was being pushed up against the wall and so he asked to reconvene the meeting in three days. It is clear enough from the biblical narrative that Jeroboam was setting the new King up and was advocating open rebellion. No Monarch would stand for such an open display of contempt, and neither will King Rehoboam. Unfortunately, the new King was hot-headed and did not listen to the advise of the elders which served King Solomon. The advice they gave the King was to grant their petition and that the people would be his servants forever. But Rehoboam’s friends and colleges gave him bad advice, and Rehoboam determined to increase their suffering. The result was the open rebellion against the house of David and the creation of the Northern Kingdom, commonly referred to as the 10 tribes, Ephraim, Samaria and the House of Israel. The new kings response to the House of Israel (the 10 northern tribes) causes a rift which splits the nation into two separate nations. The natural response from Rehoboam is to organize an army to restore order and forcibly place the northern tribes under Davidic rule. While we might feel compassion for the plight of Israel, HaShem clearly states that this was an open rebellion against the God-ordained authority of His Mashiach…… “So Israel has been in rebellion against the House of David to this day”. 2 Chronicles 13:8-19 “So now you intend to resist the Kingdom of the LORD through the sons of David, being a great multitude and having with you the golden calves which Jeroboam made for gods for you. “Have you not driven out the priests of the LORD, the sons of Aaron and the Levites, and made for yourselves priests like the peoples of other lands? Whoever comes to consecrate himself with a young bull and seven rams, even he may become a priest of what are no gods. “But as for us, the LORD is our God, and we have not forsaken Him; and the sons of Aaron are ministering to the LORD as priests, and the Levites attend to their work. “Every morning and evening they burn to the LORD burnt offerings and fragrant incense, and the showbread is set on the clean table, and the golden lampstand with its lamps is ready to light every evening; for we keep the charge of the LORD our God, but you have forsaken Him. “Now behold, God is with us at our head and His priests with the signal trumpets to sound the alarm against you. O sons of Israel, do not fight against the LORD God of your fathers, for you will not succeed.” But Jeroboam had set an ambush to come from the rear, so that Israel was in front of Judah and the ambush was behind them. When Judah turned around, behold, they were attacked both front and rear; so they cried to the LORD, and the priests blew the trumpets. Then the men of Judah raised a war cry, and when the men of Judah raised the war cry, then it was that God routed Jeroboam and all Israel before Abijah and Judah. 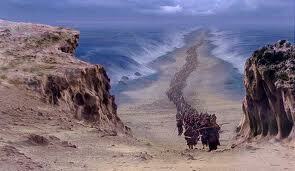 When the sons of Israel fled before Judah, God gave them into their hand. Abijah and his people defeated them with a great slaughter, so that 500,000 chosen men of Israel fell slain. Thus the sons of Israel were subdued at that time, and the sons of Judah conquered because they trusted in the LORD, the God of their fathers. Abijah pursued Jeroboam and captured from him several cities, Bethel with its villages, Jeshanah with its villages and Ephron with its villages. 2 Chronicles 11:16-17 Those from all the tribes of Israel who set their hearts on seeking the LORD God of Israel followed them to Jerusalem, to sacrifice to the LORD God of their fathers. They strengthened the kingdom of Judah and supported Rehoboam the son of Solomon for three years, for they walked in the way of David and Solomon for three years. And so there was a small exodus of sorts from the Northern Kingdom of all the priests and Levites plus those among the 10 tribes who wanted no part of the new kingdom of Israel and their mixed Judaism. The text above says that they (the Priesthood) supported Rehoboam only for three years. This is due to his apostasy noted in 1 Kings 14:21-24. By his 5th year of rule, Rehoboam was invaded by Shishak, the King of Egypt who carried away the treasures of the Beit HaMikdash (the Temple). • He made houses of worship on the old heathen high places. • He made priest from among the people who were not sons of Levi. • Instituted a pagan version of Succot in the eighth month. • Jeroboam (Ephraim) and the House of Israel (10 tribes) rebel against the house of David. Christianity also has rebelled against the ‘lawgiver’ the House of Judah (and HaShem who ordained their authority), but also specifically against the House of David. While most people have been taught that the apostles were the governing body over the Nazarenes, in reality they answered to the House of David within their sect who were the ultimate authority. The gentile Church rebelled against the Davidic lead sect of the Nazarenes. Eventually even they abandoned Judaism. • David unites both houses of Israel into one Kingdom. Just as it was in ancient times, it with be a Son of David ruling as King who will re-unite both houses of Israel into one nation in the earth. This is the hope which we have, the Good News of the Kingdom. • Solomon’s reign of peace and prosperity. This is a picture of the Messianic Kingdom. Israel and Judah will be one people again. The Light of the World will be built in Jerusalem so that “My house will be called a house of prayer for all the peoples. The nations will flow to Zion and it’s king just as it was in the days of Solomon. These two tribes have each inherited a portion of the right’s of the firstborn. Judah has been made HaShem’s lawgiver (Genesis 49:10, Psalm 60:7 & 108:8) and Ephraim is given the birthright. Only together under one Davidic king and kingdom will they be brought together to shine forth the Light of HaShem for all the nation to see.